In order to get a usable passport photo you will need a proper setup. The proper position of household lights and a good background will give you a shot that you can edit and send in with your passport application. Taking your own passport photo can save you some money, but that isn't the reason to do it. The number of places still offering passport photos is dwindling. Even if you find one, they can be draconian in their rules, allowing just two shots regardless of how they turn out. This can be especially frustrating if you are trying to take passport photos for children. 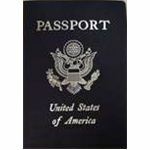 By taking your own passport photos and then using your digital photography software to get what you need, you can save a lot of aggravation. Need 20 shots to get the right one? Just keep snapping. The photo cannot be more than six months old. The photo must be 2 inches by 2 inches. The photo must have continuous tone quality. The full face, including the hairline and both ears must be visible. No one else can be in the picture including body parts such as a parent's hands holding a child. No objects are allowed in the picture. No shadows allowed on either the subject or background. Background must be white or off-white. The main mistake made in taking a passport photo is just aiming a regular camera with a pop-up flash at the person and taking a picture. This will inevitably violate the rule about shadows on the background. It may also cause shadows on the face and may also alter the tone and color of the picture. In order to get a usable passport photo, you'll need to go with a studio-like setup. Don't worry, you don't have to buy a lot of equipment. A few household items will allow you to get a quality passport photo without building a home photography studio in your basement. First, you want to avoid using the flash at all. So, set your digital camera to one of the manual modes that allow you to control the flash, or set your flash to "off" instead of auto. Sunlight and overhead lights are going to cause shadows on the face. Instead, go to the brightest room in the house (or other location), preferably one with big windows. Don't use windows with the sun streaming into them. If your best room has west facing windows then take your photos in the morning while plenty of light is coming in, but the sun isn't directly shining into the room. Now, you'll need to get your passport photo in Photoshop to finish it out. Once upon a time, the State Department actively discouraged people from using digital cameras for passport pictures. Later, they were fine with digital pictures, but discouraged people from creating their own passport pictures. Now, you can do it yourself, you just have to do it right.